"We are very excited about the new Vivid Hall algorithm”, says Stian Aagedal, CEO of Acon. "The algorithm is time variant even when all modulation is turned off and therefore has a distinct sound quality to it that cannot be captured by convolution reverbs. Interesting for the tech-savvy is that the technology is completely different from traditional reverb design and is not based on the variations of FDN networks, comb- or allpass-filters found in the vast majority of digital reverbs”, he continues. 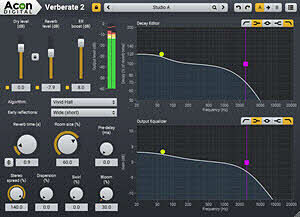 A large catalog of beautiful factory presets is delivered with Verberate 2 and a clear and straightforward graphical user interface simplifies the search for a specific reverb sound. The stereo edition of Verberate 2 was released today and is available in the Acon Digital Store for $99.90 USD. The surround capable Verberate Immersive 2 will be released in April 2019 and will support all common surround and immersive audio formats at a price of $199.90. Owners of the stereo version will be able to upgrade for $99.90 USD.